Note: After I wrote this essay I came across the site http://www.anthrogenica.com that deals with the type of issues I discuss. Clearly, my negative experience is not unique. I had recently my DNA analyzed by 23andMe and I received a report on my ancestry. The top level result, "69.3% European and 28.6% Middle Eastern" seemed right. My mother's family came from Bithynia (Western Asia Minor) that had a significant Greek presence since the time of the Trojan Wars (about 3,000 years ago) and my father's family came from Cappadocia, a region in Central Turkey that is closer to Syria than the Agean Sea. But at the next level, the results were quite strange. It is claimed that I am 35.7% Italian. Below is an illustration showing ancestry by generations (Original in https://you.23andme.com/reports/ancestry_composition/. Clicking on "Italian" pops up a window with the text "You most likely had a parent, grandparent, or great-grandparent who was 100% Italian. This person was likely born between 1840 and 1900." The trouble with this statement is that I know all my ancestors who were born after 1840. (For example, my grandparents were born between 1860 and 1885.) On my father's site I traced my ancestry all the way to 1806 and they were all from Cappadocia. On my mother's site I know of a great-great-grandfather who moved from Crete to Bythinia around 1840, married a local woman and settled there. (For more details see http://www.theopavlidis.com/AsiaMinor/History1.htm.) No trace of Italians there. So how come 23andMe came up with such an erroneous report? The green area represents a state that may have existed for over 1000 years before being dismembered and absorbed by two other states, A and B. Using the methodology of 23andMe a person with ancestry in the "green" state will be assigned either to state A or to state B with the placement dependent on the samples from A or B in the company's database. It turns out that this is exactly the cause for the error in my ancestry report. The "green" state is the Roman Empire that lasted till 1453 and until about 1100 covered (among others) Greece, Southern Italy, and most of Asia Minor. (By the way, people refer to the late Roman Empire as the Byzantine Empire but this a modern appellation; there was never a state with the name Byzantine Empire). 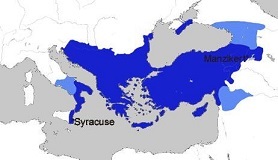 The two maps below show that Southern Italy, Greece, and Asia Minor were part of the same state for over 500 years. 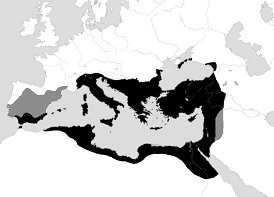 As a matter fact the connection goes back to 1000 BCE with the Greek colonies in Southern Italy and Sicily and in Western Asia Minor (Ionia). Barbujani and Sokal [ "Zones of sharp genetic change in Europe are also linguistic boundaries", Proc. Nat. Acd. Sci. USA, vol. 87, pp. 1816-1819, March 1990.] gathered genetic markers from over 3000 European sites and plotted a surface of their distributions. Then they looked for places where there were discontinuities. There is a boundary in the north of Greece separating Greeks from the Slavs. But there are no boundaries along the Ionian or the Aegean seas (even though there is a boundary between Sicily and Malta). In other words, there are no significant genetic differences between Greeks and Southern Italians or Greeks and Western Turks. Given this history these findings are not at all surprising. By the way, Greek was still spoken in isolated villages of Southern Italy well into the 20th century. Greeks and Italians themselves are well aware of their similarities. The following is from a Wikipedia article (https://en.wikipedia.org/wiki/Greece%E2%80%93Italy_relations): "In July 2014, an official artistic exhibition with the title "Italy – Greece: one face, one race" was inaugurated in Rome on the occasion of the passing of the EU Council Presidency from Greece to Italy. The title of the exhibition refers to a saying, "mia fatsa mia ratsa" (Italian: "una faccia, una razza"), often used in Greece to express the perception of close cultural affinities between Greeks and Italians." Finally, modern Greeks did not start calling themselves Greeks (Hellenes) until after the 1821 revolution that created the modern Greek state. As subjects of the Roman Empire they called themselves Romans, even though they spoke Greek. They kept the same appellation under the Ottomans and the word "Rom" in Turkish means an Orthodox Christian. The term Ρωμηος is still used today in Greece. What does 23andMe mean by "Balkan" ancestry? The Balkans have two major distinct ethnic groups: Slavs and the old inhabitants (Greeks, Albanians, etc). The paper by Barbujani and Sokal shows a sharp genetic boundary between the two. But these groups are quite diverse. Greeks and Albanians have been in the Balkan peninsula since pre-historic times. Most of the others are Slavs who settled in the area after the fifth century. There is one glaring exception, the Maltese! These are the inhabitants of Malta, an island in the Mediterranean south of Sicily and about 1000 miles away from the Balkan peninsula. How they were included in the Balkan ethnic groups is a mystery to me. However, I am not the only one mystified. See http://www.anthrogenica.com/archive/index.php/t-8007.html. Note added on August 8, 2018: A new item The Fundamenteal Flaw in 23andMe Methodology has been posted. First Posted on May 30, 2017.